"International Day with the Critters"
The Santa Ana Zoo's "International Day with the Critters" will be held on Sunday, December 18th from 12 noon - 3pm, rain or shine. The annual event is included with the price of admission and FREE for Zoo members. Guests will take a "trip around the world" exploring and discovering international stations throughout the Zoo and getting their "passports" stamped. Each station will feature an animal from a different country around the world. Live entertainment, games, storytelling, special children's crafts and educational activities will take place throughout the day. "International Day with the Critters is an engaging, high-energy event for family and friends who want to get together and learn about animals from all over the world," says David Exline, FOSAZ Board President. "Add to the mix our trains, the carrousel and dueling playgrounds conveniently located next to The Knowlwood Cafe and our picnic tables and you've got the makings for a great day!" Guests of International Day with the Critters will be among the first to experience the Zoo's "Winter Zoobilation" decorations including a frosty theme, fairy lights and falling snow. Additional decorations including beautiful, original hand-crafted adornments that are perfect for pictures and depict many holiday favorites including Santa's Workshop, Sweet Shop and Post Office cut outs of 3-dimensional wood and individually designed and painted by Friends of Santa Ana Zoo (FOSAZ) Board Member Rip Ribble, will be on display Dec. 1-31, 2016. The Santa Ana Zoo is home to more than 260 animals, including 60 of the most interesting and engaging monkeys and several endangered species, like the golden lion tamarins. The Zoo is open daily from 10:00 am - 4:00 pm. To become a Member of the Zoo, please call (714) 953-8555 x13. The Santa Ana Zoo in Prentice Park is located at 1801 East Chestnut Avenue, Santa Ana, CA 92701. It's Boo Time at the Santa Ana Zoo! Mark your calendars, grab your costumes, and join us for our annual "merry not scary" Boo at the Zoo! The Friends of Santa Ana Zoo and B.P.O. 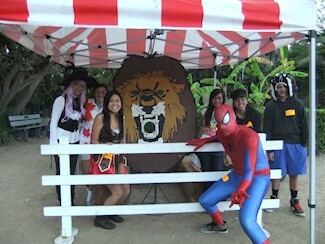 Elks Santa Ana Lodge #794 present the 26th Annual Boo at the Zoo located at the Santa Ana Zoo, "Home of the 50 Monkeys." The event will take place from 5:30 PM to 8 PM on Saturday, October 22, and Sunday, October 23; Friday, October 28; Saturday, October 29; and Sunday, October 30, rain or shine. Boo at the Zoo is one of Orange County's longest-running Halloween events, providing a fun, safe, and family-friendly event for trick-or-treaters and children of all ages who love to wear costumes and embrace the Halloween spirit! Guests will have the opportunity to explore 10 prize stations on our Trick-or-Treat Trail, enjoy a variety of Halloween-themed games and activities - including storytelling and sing-alongs, and visit with our nocturnal animals. 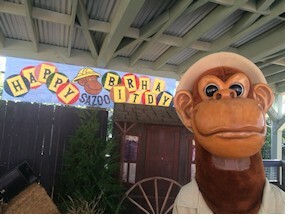 Guests will also be able to participate in our nightly costume parade, led by SAZOO (our monkey mascot). Our exciting "Boofari" Express Train and Conservation Carrousel rides will be entertaining little ghouls and goblins all night long. Parents, don't forget your cameras! Boo at the Zoo provides great photo opportunities that will last a lifetime. General Admission is $19.95 per non-member ages 2 and up, and only $9.95 per Zoo Member ages 2 and up. Bonus: Children under the age of 2 are free. Join as a Member to receive your half price tickets! "Boofari" Express Train and Carrousel rides will be available for an extra charge. Hot dogs, chips and soda will also be available for purchase nightly provided by the Tustin-Santa Ana Rotary Club, Zoo Docents, and Knowlwood Restaurant. For those who are a little older and more adventurous, Boo at the Zoo will once again have a separate area for our "Teen Scream" haunted house (included in the regular price of admission). This is sure to provide chills and thrills for those who dare to enter. To avoid the lines, admissions are now available online at www.santaanazoo.org (valid any night of the event, nonrefundable - bring your receipt to Will Call on the night of the event). You may also purchase admissions at the main gate on the night of the event. For more information, please call (714) 953-8555. 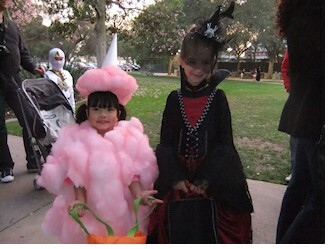 So grab your costume and we'll see YOU at the BOO at the Santa Ana ZOO! 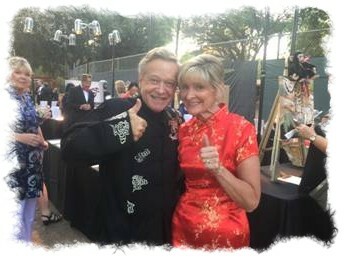 The Friends of Santa Ana Zoo (FOSAZ), a non-profit organization, hosted the 24th annual Zoofari fundraising black-tie gala on August 27, 2016 for almost 300 guests with a theme "Year of the Monkey". Zoofari takes place at one of the most inspiring venues in Orange County, outside and under the stars on the grounds of the Santa Ana Zoo. Valet parking service was underwritten by Tudor House Productions; guests enjoyed a first-class dining experience catered by Parties by Panache with a hosted bar including a special drink the "Rickshaw Ricky" in honor of longtime supporter of the Santa Ana Zoo Richard Bye who passed away early this year - the special drink was made with Tito's Handmade vodka, Lychee syrup and Cranberry juice. Decorations were provided by R.W.B. Party Rentals which celebrated the Asian "Year of the Monkey" theme with gold, black and vibrant red throughout event site. "For more than 20 years, Zoofari has played an integral role in raising the funds needed for all the special projects and improvements going on here at our favorite community Zoo including educational programs, breaking ground on new animal habitats, tackling important conservation initiatives, introducing new rides and upgrading service facilities for our guests to use and enjoy," says Cathi Decker, event host and Executive Director of FOSAZ. Guests began the night being greeted by various animals and their docent "handlers". An Armadillo, Blue Tongue Skink, Spectacled Owl and a French Rooster were just some of the animals that welcomed everyone as they entered the Santa Ana Zoo. Guests were also privy to tour the Zoo grounds and see the area where the new Giant River Otters will be housed and of course the 50 monkeys the Santa Ana Zoo is famous for. Former KTLA sports anchor Ed Arnold and co-owner of South Coast Plaza Sandy Segerstrom Daniels were the Masters of Ceremonies for the evening with brother and sister duo Glen Fladeboe and Kristine Fladeboe Duininck as auctioneers for the live auction. 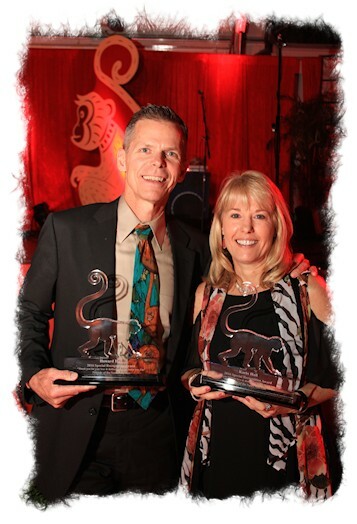 Honorees this year were FOSAZ Board Members Howard and Karin Hall who have been instrumental to the Friends of the Santa Ana Zoo since 1992. They have put together Eagle Scout projects that have changed the face of the Zoo, participated on the Board in many activities and during special events and helped bring our largest revenue generators to the Zoo in the form of the rides. The event raised over $160,000 which included $29,000 from the live auction where funds will be going towards the Pygmy Marmoset exhibit as during the program, it was announced the exhibit needed refurbishing as these "finger monkeys" are difficult to see by Zoo guests. Now construction will be underway for a "2-way" mirror so guests can see them better and make life more comfortable for the monkeys. The Year of the Monkey "Good Fortune" live auction items up for grabs were an Apple iPad Pro with an iPad Pro Smart Keyboard and Apple Pencil donated by FOSAZ Board Member and the evening's honoree Howard Hall; a 4th of July party for 12 with all the trimmings by Parties by Panache; eight days in beautiful Cabo San Lucas at the Villa del Palmar with a gift card for $800 for airfare donated by FOSAZ Board Member Curtis Farrell; a powder blue Michael Kors Harper Tote (donated by FOSAZ Board Member Patty McClendon) stuffed with 100 California Scratchers (donated by Board Member Rip Ribble) and close to $1,000 in cash donated by the FOSAZ Board, Advisory Board Members and FOSAZ staff; McClendon also donated her Cathedral City condo for 8 days which included a Westin Mission Hills Golf package; four private tours of the Santa Ana Zoo with Zoo Director Kent Yamaguchi (which includes lunch) were sold and the largest and most sought after item was the 30 minute flight for 2 in the Goodyear Blimp as this is one of the final flights it will be taking. Jane Olin, FOSAZ Board Member and Tim Jerkovich were the lucky winners of the Blimp flight! After the program, guests danced until midnight to the dynamic tunes of NeOn NaTiOn. Zoofari is chaired by Cathi Decker and sponsored by FOSAZ, a non-profit organization which has helped support and improve the Santa Ana Zoo for over 44 years. The Friends of Santa Ana Zoo (FOSAZ), a non-profit organization, are pleased to announce tickets sales, media and sponsorship opportunities for its 24th annual "Year of the Monkey" gala fundraising event are now generally available for purchase online or by calling (714) 953-8555 x10. Tickets to this year's exclusive black-tie gala under the stars are $300 each or $3,000 for a private table of 10. All tickets must be purchased in advance of the event, which will take place Saturday, August 27 from 5:30 to 11:30pm at the Santa Ana Zoo in Prentice Park located at 1801 Chestnut Avenue in Santa Ana. Space is limited and tickets will not be sold at the door. With an expected attendance of more than 400 guests, the glamorous Zoofari fundraising event includes valet parking service underwritten by Tudor House Productions, a first-class dining experience catered by Parties by Panache and a hosted bar including a special signature drink, "Rickshaw Ricky." Partygoers will enjoy a "Year of the Monkey" themed photo op and decor by R.W.B. 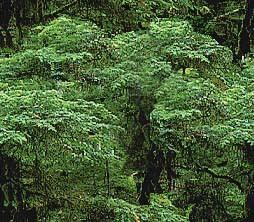 Party Props, dancing to the sounds of a live band and an opportunity to bid on wonderful trips, beautiful baskets, and one-of-a-kind gifts during the event's live and silent auctions hosted by renowned auctioneer Glen Fladeboe. 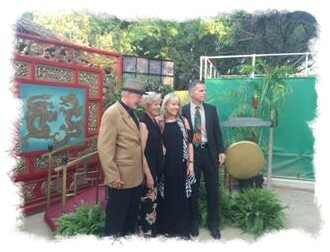 Honorees this year are FOSAZ Board Members Howard and Karen Hall who have been instrumental to the Friends of the Santa Ana Zoo since 1992. They have put together Eagle Scout projects that have changed the face of the Zoo, participated on the Board in many activities and during special events and helped bring our largest revenue generators to the Zoo in the form of the rides. "For 24 years, Zoofari has played an integral role in raising the funds needed for all the special projects and improvements going on here at our favorite community zoo including educational programs, breaking ground on new animal habitats, tackling important conservation initiatives, introducing new rides and upgrading service facilities for our guests to use and enjoy," says Cathi Decker, event host and Executive Director of FOSAZ. 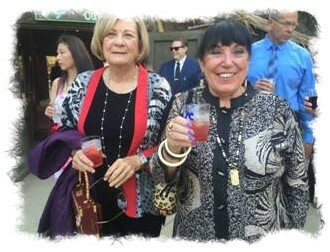 "Zoofari is a first-class fundraising event that demonstrates the love and investment the local community, surrounding businesses and FOSAZ have for the Zoo," says David Exline, President of the FOSAZ Board. "2016's "Year of the Monkey" gala promises to be another endearing and festive evening our guests will cherish and a night of giving that will have a lasting and positive impact on the Santa Ana Zoo for years to come." To find out more about the 2016 Year of the Monkey Gala, discuss potential sponsorship opportunities or to reserve seats and purchase tickets, call (714) 953-8555 x10 or visit www.santanazoo.org. The Santa Ana Zoo announced today, the Zoo's "Sunsets at the Zoo" summer concert series and "Brew at the Zoo" beer-tasting events sponsored by Guaranty Chevrolet of Santa Ana & the Friends of Santa Ana Zoo (FOSAZ) return by popular demand again this summer adding a fifth night! The first summer concert and brew-tasting event will take place Sunday, June 12th at 5:30 pm. Tickets can be purchased online at www.santaanazoo.org or at the gate on the night of the event. Visit the zoo animals in this rare after-hours experience as they prepare for their nighttime activities, enjoy live music, a silent auction, train/carrousel rides, as well as a unique craft brew-tasting experience from a handful of Orange County's finest craft beer brewers. "The combination of Sunsets at the Zoo and Brew at the Zoo makes for an event every generation can enjoy," says FOSAZ Board Member Kristeen Stolo, "It's a casual, cool event for families, friends and even first dates." Zoo members and guests are welcome to grab their cameras, bring a blanket, pack a picnic or purchase BBQ items provided by the SA Zoo keepers, and enjoy a relaxing, fun-filled musical evening outside under the California sky. All proceeds raised this year will go towards our capital campaign for the upcoming Giant River Otter Habitat. The Santa Ana Zoo is part of the SAFE (Saving Animals From Extinction) program through AZA (Association of Zoos and Aquariums). Brew: Tustin Brewing Co. and Stone Brewing Co. Brew: The Bruery and Bootlegger's Brewing Co. Brew: Cismontane Brewing Co. and Barley Forge Brewing Co.
"Sunsets at the Zoo and Brew at the Zoo deliver a cool Sunday summertime activity for friends, families, and couples who enjoy listening to live music, picnicking on the lawn, and tasting great brews," says Steve McGuigan, event organizer and Communications Chair for the Santa Ana Zoo Board of Directors. "We're thrilled to once again welcome local artists and showcase the craftsmanship of Orange County's finest breweries at Sunsets and Brew at the Zoo." The Santa Ana Zoo today announced its annual Party for the PlanetTM event will take place Sunday May 15th, 2016, from 12 noon to 3:00 pm on the beautiful Santa Ana Zoo grounds, "Home of the 50 Monkeys." Exclusive to AZA-(Association of Zoos & Aquariums) accredited establishments, Party for the Planet represents the largest shared Earth Day celebration in North America. Open to the public, Party for the Planet is a fun-filled day that celebrates wildlife while promoting conservation and educating Zoo guests about the different ways they can explore and help protect the environment. The event is FREE for FOSAZ Members and included in the price of general admission. Santa Ana locals with proof of residency are welcome to join the Zoo's Party for the Planet free of charge. Throughout the event, Zoo guests will enjoy conservation-friendly crafts and fun games, as well as learn from hands-on demonstrations and education stations featuring animals, recycling, sustainable living and a variety of special guests including members of the Santa Ana City Water District, Fullerton Arboretum and the USGS Western Ecology Research Center. Families are encouraged to pick up a "Let's Play! with the Santa Ana Zoo" guide book and enjoy this brand new program for exploring nature as a family. "Let's Play!" will take families through the Zoo and Santiago Creek Wildlife and Watershed Center and their own backyards as they look, measure, and listen to the nature around them. "This year's Party for the Planet event marks the 15th year the Friends of Santa Ana Zoo has hosted an event in honor of Earth Day," said Cathi Decker, Executive Director. "We're excited to welcome FOSAZ members and Zoo visitors to celebrate with us on May 15th and enjoy all the Santa Ana Zoo and our special guests have to offer." Adding to the celebration are the eco-friendly, electric powered Zoofari Express Train rides ($4 each) and the Conservation Carrousel rides ($3 each). Punch cards and combination tickets are also available to FOSAZ members and guests. Children under 2 ride free with paid adult on the Train and adults standing with children on the Carrousel are free. Guests will also enjoy the Zoo's eco-friendly facility improvements including upgrades to the Exploration Outpost, playground, gardens, and new drinking and water bottle refill stations. The Santa Ana Zoo, "Home of the 50 Monkeys," today announced its 64th wild animal birthday celebration will take place Saturday, March 5th and Sunday, March 6th, 2016 on the Zoo grounds from 11:00 am to 2:00 pm. Live music and entertainment are included in the cost of general admission. Throughout the event, children and adults will enjoy miniature train displays by Del Oro Pacific, singing happy birthday, dancing on the lawn, and visiting with the Zoo's enchanting and playful animals, which now includes a baby anteater, a baby howler monkey, a baby ocelot and a baby sloth. The marvelous Ballet Folkloric will perform and SAZOO, the Zoo's resident monkey mascot and honorary OC celebrity, will also be on hand to engage, entertain and take photos. At noon daily, Zoo Members and paid guests will be treated to a piece of birthday cake, compliments of Knowlwood Cafe, while supplies last. Additionally, Zoo birthday guests will love visiting the Crean Family Farm and the Colorful Amazon Aviary. Zoofari Express Train Ride tickets will be available for $4 each, Conservation Carrousel tickets for $3 each and combo tickets for just $6 each. Children under 2 are free to ride with paid adult on the train and adults standing with children on the Carrousel are free. The Zoo's conservation friendly playground and multiple picnic areas are also open to guests at no additional charge. "For 64 years The Santa Ana Zoo has remained one of Southern California's most memorable places for families and friends to come together, enjoy wildlife and learn about conservation and the wonders of nature," says FOSAZ Executive Director Cathi Decker. "We are thrilled to once again share our birthday celebration with the community and our growing family of wild animal friends!"